At one time, the Red Savina pepper was the hottest pepper in North America... but more importantly, this is a heck of a hot tasty one. To balance out the tremendous heat of the Red Savina, we had to douse the flames with fresh green bell peppers, onion and a dash of garlic and mustard. 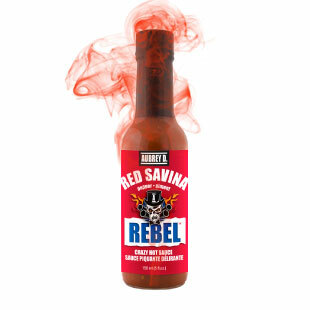 Delicious and crazy hot, Aubrey D. Rebel Red Savina Hot Sauce is one that all good chiliheads will want to have in their collection.